LYON, France (AP) — Crowd disorder delayed the Lyon-Besiktas kickoff by 45 minutes in the Europa League quarterfinals on Thursday. 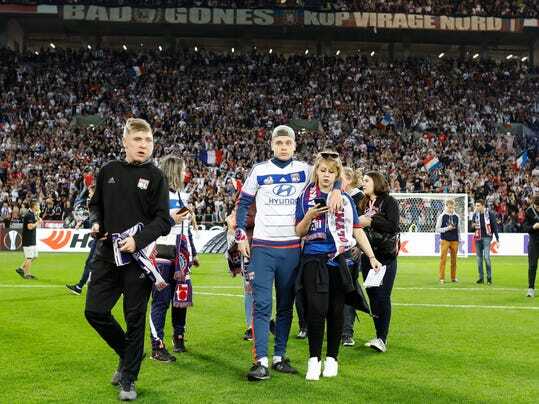 Incidents inside Lyon’s stadium — which will host the final next season — followed fighting among rival French and Turkish fans earlier in the city. About 20 minutes before the scheduled 9:05 p.m. (1905 GMT) kickoff, fans spilled on to the field for their own safety as fireworks were set off and missiles thrown from an upper section of the stadium housing Besiktas supporters. Lyon president Jean-Michel Aulas was among the officials on the pitch trying to restore calm. The quarterfinals first-leg game kicked off at 9:50 p.m. (1950 GMT) .The return game is in Istanbul next Thursday.